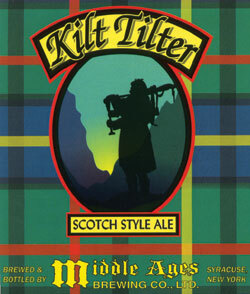 The Kilt Tilter pours a dark brown murky hue with a large creamy light brown mostly diminishing head with virturally no lacing. The nose detected a light malty presence with a hint of alcohol. It didn't have a overpowering aromatic presence. The light bitter taste ,with a strong presence of toasted malts, moves into a moderately sweet finish for an average duration. It's light to medium in body with soft carbonation and leaves the palate slightly oily. The taste was much sweater than it's aroma â€“ Jen. It's not as sweet as the killer bee â€“ but is still tasty - Ian/Kristen. Reviewed on February 4th, 2007.